There is a bug using the GUI version (v3) of this mod with GTW, it can push the option to take paid vacation time off from the phone for sims with careers that have an additional phone option (e.g. negotiations). Until I can figure out a fix, it's probably best to just use the older cheat command version of the mod. Version 3 Update - This update is REQUIRED if you are running the latest game patch (March 26). The old cheat command version is still compatible. Be sure to delete the old version of the mod when you update. Version 2 and Later Includes a Career Fix - This can be used to fix the career branch for a sim who quit their career and rejoined it later. This bug can cause problems with future promotion and unlocking promotion rewards. Open the cheat command window and enter the command sims.patch_career_branch A message will appear indicating whether the patch was successful or if the sim's career branch was not bugged. This command is included in both versions of the mod. This mod works by carefully making a sim quit their career (for a few milliseconds), erasing their progress in their current career branch, promoting them to the top level of the original career and then promoting them AGAIN so that they can select a new career branch. Okay, maybe not simple. But at least I made it simple to use! 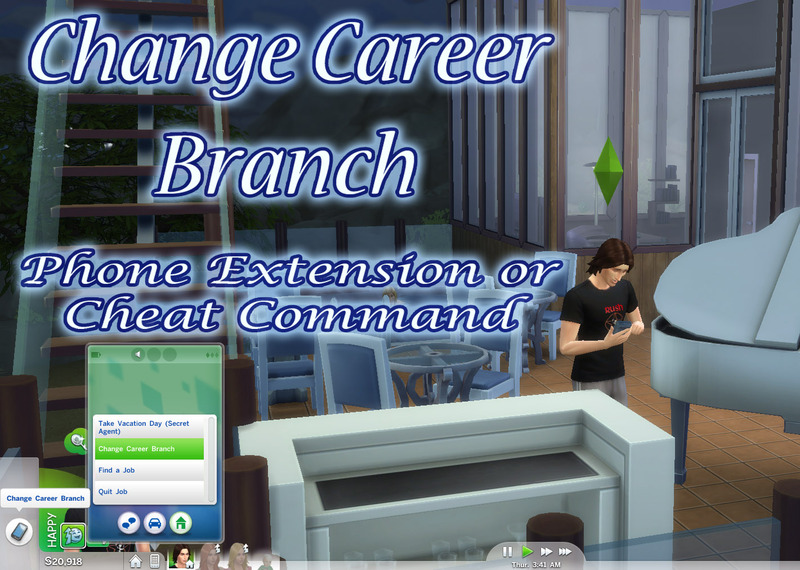 The full version adds a "Change Career Branch" menu item straight onto the sims' phones, so even a stupid sim can now change their career branch. The choice will only show up on a sim's phone if they have a career that can actually be quit. If they haven't progressed far enough to be on a career branch, they'll spend a few minutes on the phone only to be yelled at by the boss saying they can't change their career. I mean, you can understand the boss's anger at being asked to allow them to change from being a journalist to an author when the sim isn't even a journalist to begin with! For the braver soul (or those running an old version of the game), there is also a cheat command version that adds a sims.change_career_branch command to the cheat console. This isn't available with the normal version, but you can always install both versions of the mod - it won't hurt anything. The end result is the same whichever version you use. 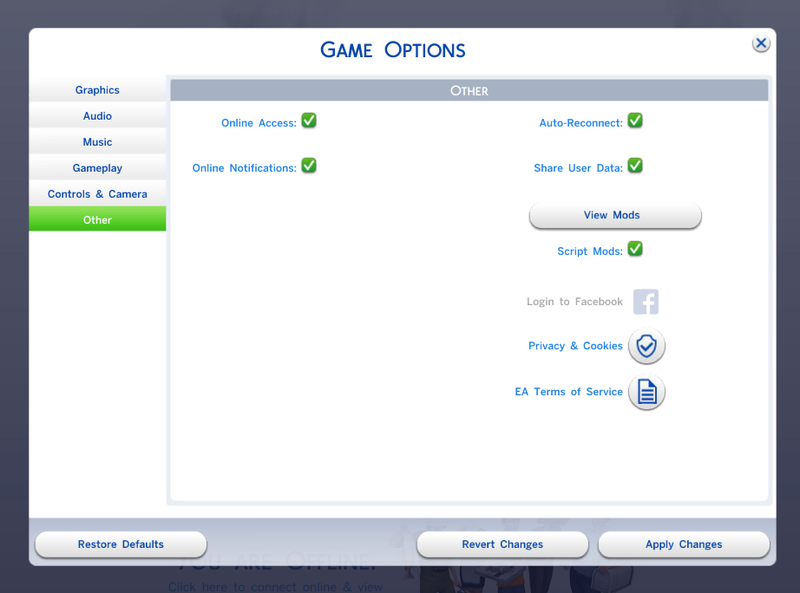 For easiest installation, I strongly urge using The Sims 4 Mod Manager by Raxdiam for a fully automatic install, or you can install manually. Manual installation is only suggested if you are familiar with combination package/script mods. See below for more information. Princemajik also covers the manual install process in a mod review on YouTube. Although this video is for the SimLotto mod, the same technique is used for this mod. Script mods must be enabled in your game options for this mod to work properly, even if you install with the mod manager. This mod was written and tested on Windows for The Sims 4 version 1.4.83.1010 (February 3, 2015), but should be compatible with any version since 1.3.18.1010 (December 16, 2014) when the interface for the phone was changed. The cheat command version should work with any Windows version since 1.0.732.20 (October 1, 2014). No XML files were changed for this mod, everything in the package is new and the script injects the new XML into the sim's phone. As such it should not conflict with any other mod, even others that modify phone menus. The zip file you downloaded should contain a package file and a zip file ending in _Script. Place both files into your Mods folder, but do not unzip the zip file ending in _Script -- that should end up in the Mods folder still zipped. The mod will only work if BOTH the _Script zip file and the package file are in your Mods folder. If you wish, the package file can be placed into a subfolder, however the script file must be placed directly in the Mods folder. Just put the zip file containing the script into your Mods folder. Do not unzip the file and do not place it in a subfolder, but directly in the Mods folder. Both versions can be installed if you wish, they will not conflict.